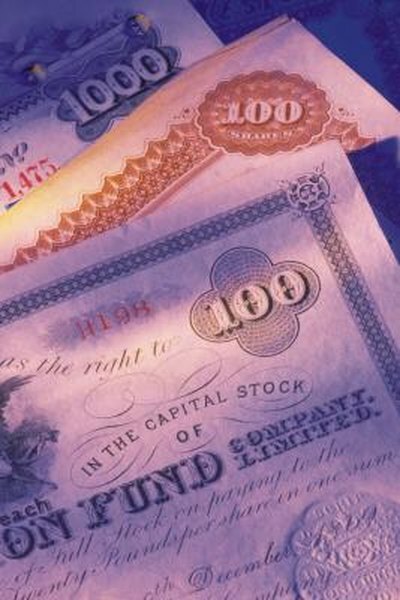 Many companies no longer offer paper stock certificates. Electronic trading made stock ticket tapes obsolete, and paper stock certificates are likewise heading for extinction. Many companies no longer print paper stock certificates, and brokerage firms discourage investors from owning them. Investors who want paper stock certificates need to act fast and obtain them before they become obsolete. Go online and research how much different stock brokerage firms charge for paper stock certificates. The days of free paper stock certificates are long gone, and some brokers charge $100 or more for this service. Compare trade fees and commissions at the same time to be sure you are getting the best overall rate. Apply for a trading account online and fund it once the account is open. Decide which stock you want to buy and verify that the company is issuing paper stock certificates. Apple, Microsoft and Facebook record all their stock transactions electronically and no longer issue printed certificates. Go to your online trading account and enter the trade. Specify on the order page that you want a paper stock certificate. The trading program should alert you to the additional cost and will not process the request without your approval. If you do not have an online account, call your stockbroker to place the trade. Stress that you want the paper stock certificate. After you receive the stock certificate in the mail, verify that your name is spelled correctly. Your stock certificate is proof of ownership, so store it in a safe deposit box or other secure place. If you lose it, you will pay a hefty fee to replace it. If you buy stock in a company that incorporated in Arizona, state law mandates that the company must issue paper stock certificates. Arizona is the last state to have this requirement. You can buy as many paper stock certificates as you like at online auction sites like eBay or online stores like mystockcertificate.com or giveashare.com. If you sell your stock, you must first mail or bring the paper certificates to your broker, who will electronically deposit them into your account. This process could delay the sale for two to four weeks.